In mid-January, The Community Foundations serving Richmond and Central Virginia brought together two of their nonprofit networks – YNPN RVA (Young Nonprofit Professionals Network RVA) and ENLP Alumni (Emerging Nonprofit Leaders Program Alumni) for breakfast, information-sharing and discussion at Peter Paul Development Center. For those who aren’t familiar – YNPN RVA (the local chapter of the National organization/network) supports the growth, learning, and development of young and early-career nonprofit professionals through professional development, networking, and social opportunities (learn more about YNPN RVA here). 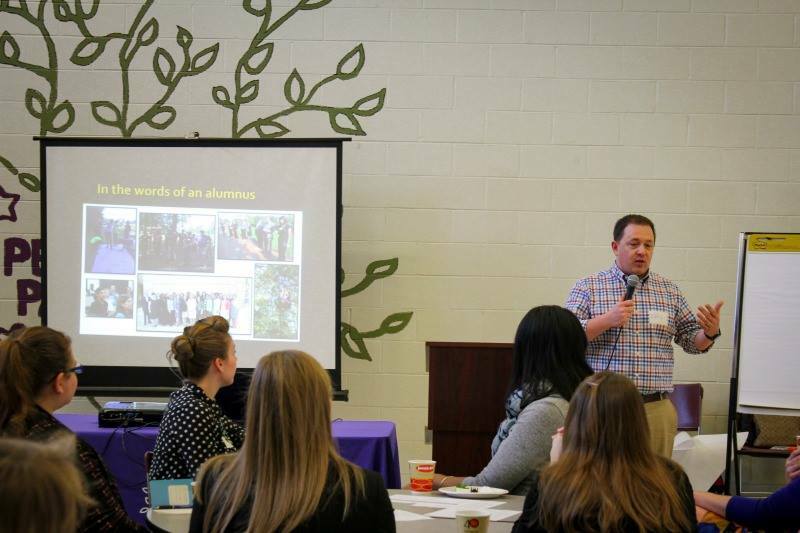 The Emerging Nonprofit Leaders Program, now in its 10th year of operation, is a dynamic eight-month experience for budding nonprofit leaders in the metro Richmond area. 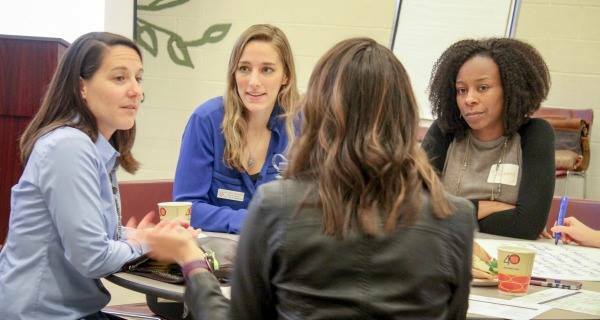 Participants have the opportunity to foster a deeper understanding of their leadership capacity, advance their understanding and practice of leading in the nonprofit sector, and strengthen their network of nonprofit colleagues (learn more about ENLP here and come to an information session – dates announced in March 2017). 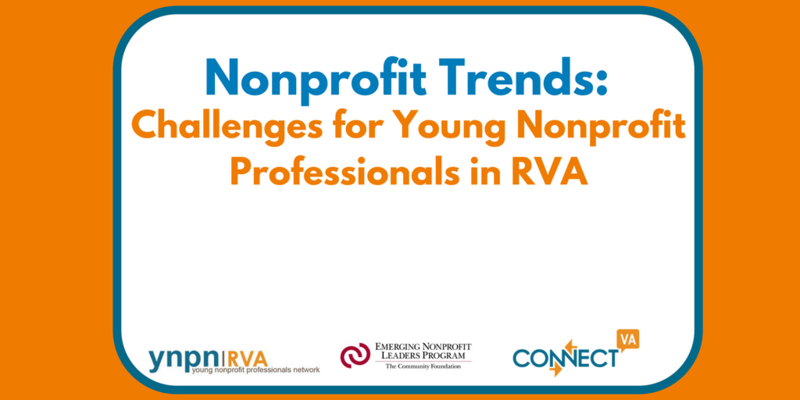 During the breakfast, there was a facilitated discussion around the biggest barriers and challenges for young nonprofit professionals in RVA. Fairly quickly, themes began to emerge, as many audience members shared similar experiences and obstacles. The group continued the discussion of specific challenges by generating ideas, tips and advice for how a young nonprofit professional (or how an organization employing a young nonprofit professional) could work to overcome some of these challenges and barriers. Not that this challenge is restricted to only young nonprofit professionals – many individuals of all ages and career experience in the sector report a struggle with creating a work-life balance, most likely because of a devotion to their organization’s mission and a passion for their career, creating an inability to separate professional life from personal life. The young nonprofit professionals in the audience talked about turnover in the sector and their organizations – and that usually this was related to “burnout” and a lack of support from their supervisor in their work. The group also mentioned that sometimes they feel a “lack of boundaries” in their position – as many organizations have employees “wearing multiple hats” because of a lack of resources and inability to hire more staff. 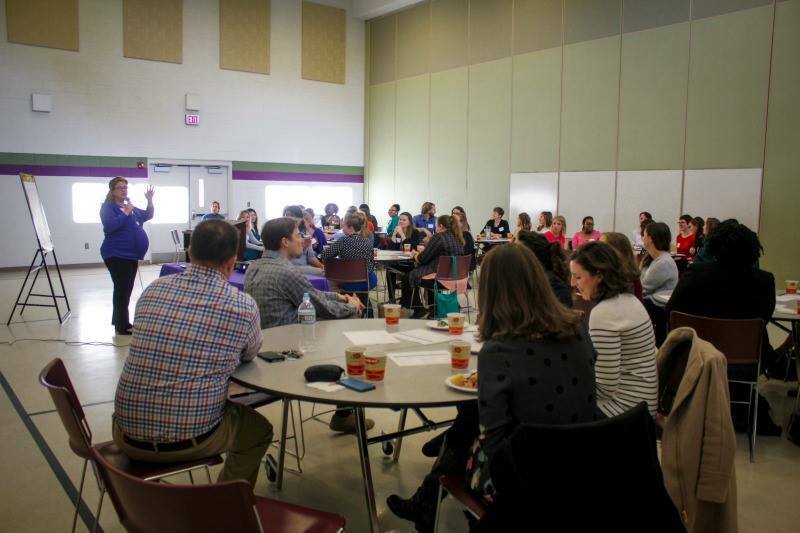 The group discussed the importance of finding an organization and supervisor that really support a work-life balance. They also stressed the importance of learning to advocate for yourself and your personal time, as well as learning to ask for help and learning how to delegate. The group even suggested looking at ways volunteers could potentially fill in and help where it makes sense. Most of these solutions really center around learning to have open and honest conversations with supervisors and peers, as well as giving yourself permission to “take a break” and figure out, besides work, what you are passionate about and what energizes you. Here are some examples of how local young nonprofit professionals incorporate “self-care” into their work day and life. Many nonprofit professionals cited, that (especially in small and medium-size organizations) they feel a lack of opportunity to build a career within the organization, by “moving up” to higher levels. They felt that it was very difficult to identify a career trajectory, not only within one’s organization, but also in the sector in general. Titles and status didn’t seem to be the most important factors in “advancing” one’s career, however. Those in the room felt that the opportunity for professional development and to build new skills were just as important as advancement. Some said support for grad school or continuing education is very desirable. Here are some upcoming local nonprofit professional development classes, in case you were wondering. The group also discussed that to get to the next level (financially) within the organization, again, learning to advocate for yourself and learning how to have difficult conversations like “asking for a raise” or “negotiating a salary” is key. In terms of working to figure out a career trajectory, finding a professional mentor, besides one’s supervisor is really important. Here are some tips for mentoring relationships. The group mentioned that there were limited points of entry into local organizations as they began their nonprofit careers. Greater Richmond still has a “small town feel”, where everyone knows one another and to get into the sector, if you are on the outside, it seemed impossible. The group reflected on what would have been helpful for them to get that first nonprofit job – and no surprise, networking was key whether they were switching sectors, coming from out of town, or from school. However, there seemed to be a lack of formal opportunities to do so (read our Tips for Networking for some detailed advice). Another big discussion revolved around volunteering while searching for your first nonprofit job. Volunteering will not only build your network, it can give you a chance to explore the mission/culture of the organization, provide an opportunity to build skills, and give you something meaningful to add to your resume. In a YNPN RVA blog post titled “Volunteering and the Real Reasons Behind Working for Free” this notion is supported by a pretty powerful statistic – 41 percent of hiring managers view volunteer work as equal to a paid job and more importantly, you have a 27 percent better chance of being hired than people who don’t volunteer.